Oatmeal and Gout explains how oatmeal might be good for gout. But, we should focus on a healthy whole diet. Because we don’t yet know enough to balance between the high fiber of oats against the high sugar content of granola. You can find granola in the Gout Foods Table for Breakfast Cereals and, as a granola bar, in the Gout Foods Table for Snacks. I was a little annoyed when I first looked at granola and gout, as I thought the diversity of granola recipes would make it impossible. Then I got really annoyed, but more of that shortly. As a breakfast cereal, all the granola items in the gout foods table are similar. They do not get highlighted as high-value cereals because, despite being a valuable source of fiber, they are very high in total sugar. 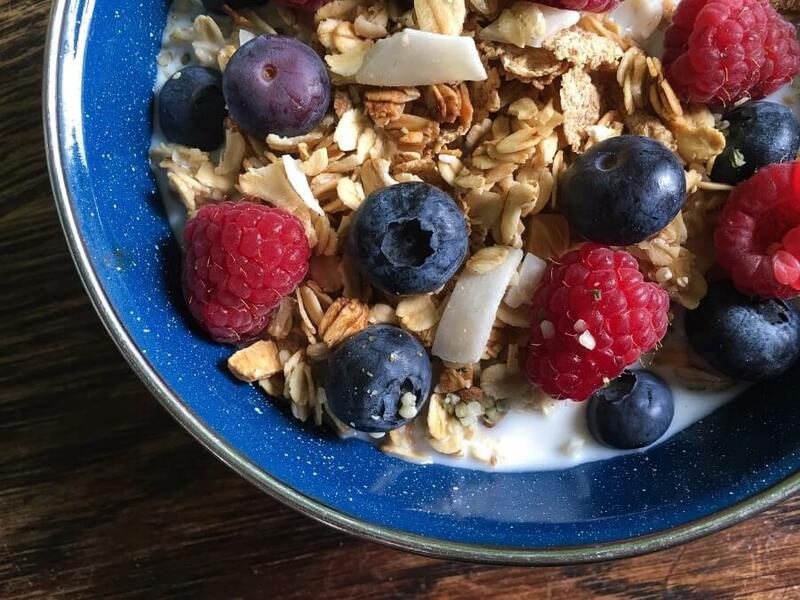 If the rest of your diet is low in sugar, then granola makes a good choice. The main ingredient is oatmeal, and this does not significantly affect gout inflammation or uric acid. However, oatmeal is high in fiber. Which might be important. Because a study of rats shows that fiber might reduce the number of purines converted to uric acid. But that study is a long way from showing benefits of fiber to uric acid in gouty humans. So, the best you can do is to focus on generally healthy foods as part of a healthy gout foundation diet. In granola, is oatmeal good for gout? As whole grains are recommended as one-quarter of all you eat, breakfast cereals are an important start to the day, and a fine opportunity to load up on healthy grains. The big drawback that really annoys me is due to fortification of many breakfast cereals. 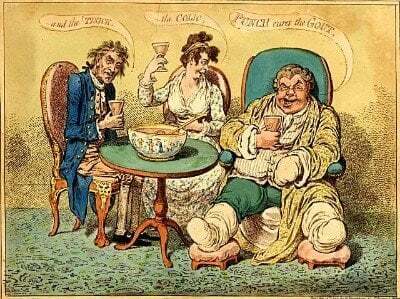 As gout sufferers, we know that excess iron is very bad for gout. Yet, many otherwise healthy kinds of cereal are fortified with iron and other supplements. The good news for granola lovers, if you can live with the high sugar content, is that granola is low in iron. If you have a low sugar recipe for granola, please share in the gout support forum. You can also use the forums to ask for any help you need about planning and improving your gout foods. Leave Granola, Oatmeal, and Gout to browse the Gout Foods Guidelines. Koguchi, Takashi, Hisao Nakajima, Masahiro Wada, Yuji Yamamoto, Satoshi Innami, Akio Maekawa, and Tadahiro Tadokoro. “Dietary fiber suppresses elevations of uric acid and allantoin in serum and urine induced by dietary RNA and increases its excretion to feces in rats.” Journal of nutritional science and vitaminology 48, no. 3 (2002): 184-193. Do you have suggestions for improving Oatmeal and Gout? Then, please add your idea to GoutPal’s Suggestion Box. Or, send the Feedback Form, below.